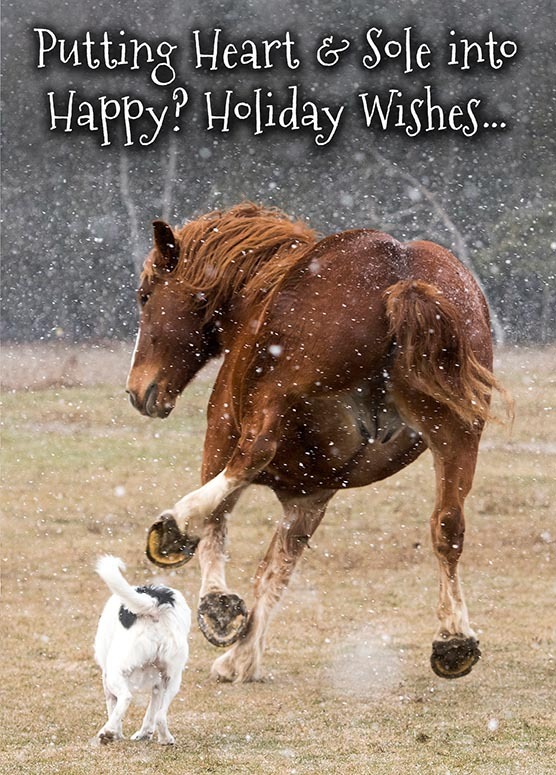 Inside: If the holidays start to make you cranky, find a friend & kick up your heels.. or take a nice break instead! Christina Handley is an award winning equestrian photographer who lives in Canada. With a career spanning over 19 years, her images have appeared in many equine and farm publications. Christina and her husband Boyd live on a working farm in Ontario, and her photos reflect real life in agriculture and with horses. They own draft horses, beef cattle and a myriad of other farm animals, housed on lovely picturesque acres that include traditional farm outbuildings; we see them all immortalized via her camera. Her appreciation and reverence for the rural lifestyle is apparent in the sensitivity of her images, and this series is no exception. At first blush, it might seem that Border Collie/Heeler Dingo may be headed into something serious, but Christina tells me that Harry the Belgian’s threatening gestures are just an act, and that the two of them have carried on like this for years. Originally a rescue, Dingo has honed his skills through his job as Handley Acres’ chief herd dog - helping to move cows between pastures, and being a top hand when calves are doctored or weaned. At eight years old, Dingo’s role on the Handley farm is a productive one. But it didn’t start out that way. As a feral four month old puppy, he had to be trapped in order to be rescued. He’d missed the socialization opportunities that are so important for a dog to learn how to get along with humans; he was both fearful and aggressive. Boyd and Christina patiently worked with him, gave him a job and now he is a well-adjusted, happy farm dog!